Did you just move to Colchester, Vermont? Let’s learn more! Colchester was chartered on June 7, 1763 and was named after the Earl of Colchester. Colchester is located on the shore of Mallets Bay, which is part of Lake Champlain. Colchester has an area of 58.6 square miles of which 38% is water. Colchester is the second most populated town in the State of Vermont. In 2015, Colchester was named Fortune Magazine’s “100 Best Places to Live” (ranked #100) and Money Magazine’s list of “50 Best Places to Live” (ranked #40). Now that you know some interesting facts, what can you do in Colchester? Niquette Bay State Park – Niquette offers hiking trails, sandy and rocky beaches (dog-friendly), picnicking, kayaking rentals, and more. They are open May 6 through Columbus Day Weekend from 10am to dusk. Feel free to bring your family and dogs. Be sure to bring a leash and clean up after yourselves and your pets to keep the trails well groomed. My favorite memories here are walking down the forest covered paths to the rock outcroppings on Lake Champlain. I’d go with friends and my dogs to go swimming here in the calm waters relaxing in the sun. Bayside Park – Located right on Mallet’s Bay, this park offers a summer concert series, beach access, kayak, canoe and paddle board rentals, beach volleyball courts, playgrounds, basketball courts, and much more! This is the place to go on a weekend with your family. On the 4th of July, be sure to bring your family to watch the fireworks after a day in the sun at the park. 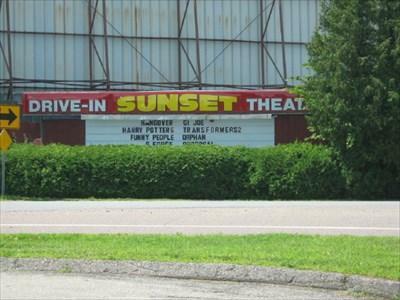 Sunset Drive In Theatre – While I’ve never been to this drive in, I’ve been meaning to go. I hear so many good things about watching movies at this drive-in theatre. Sam Mazza’s Farm – For any time of year, this iconic farm offers a farm store, greenhouses, and much more! My favorite time to go is in October to pick out pumpkins, to pet the farm animals, tour the fall plants in the greenhouses and to go through the corn maze. There’s so much more to do in Colchester than what I’ve listed so come back soon to learn more.